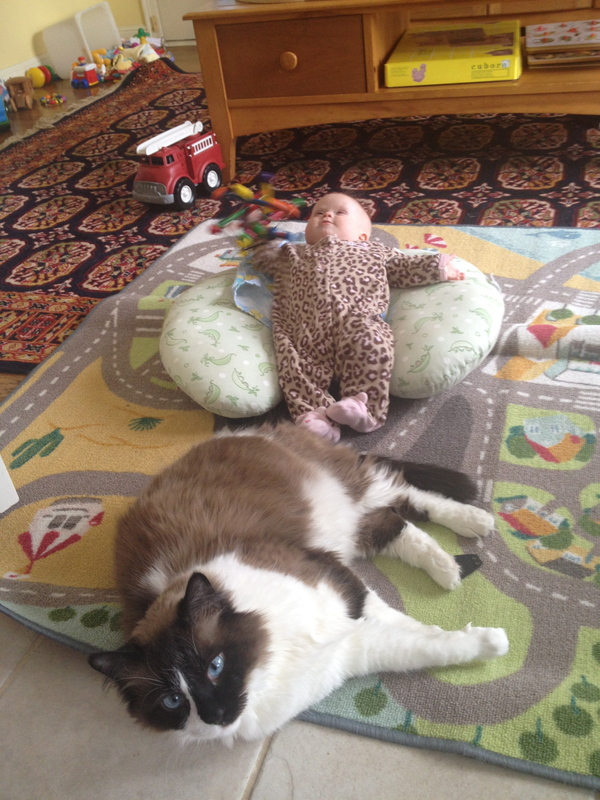 Weighing the difference: the cat is bigger than the 5-month-old baby. In the roughly three months in which I’ve been writing this blog, the WordPress.com stats reveal far and away that the most popular posts are those about Lyra. While Whoopsie Piggle will never be exclusively about our daughter, I have decided to include periodic updates on her, titled, “Lyra’s Latest,” and, like today’s post, will have a secondary title regarding the specific update. I came to this decision while writing about the past few months of Lyra’s life, which made for an unreasonably long post—even for me. This week I plan to post a handful of “Lyra’s Latest,” cut and refashioned from that intial tome of a post. Friendly Stranger: Oh, what a sweet baby, that’s a new one! How old is she? Friendly Stranger: Really? Oh, my, is she small. Was she a preemie? Friendly Stranger: How much did she weigh at birth? Me: Seven pounds, ten ounces. She has Down syndrome and they tend to be smaller. Friendly Stranger: Really? Oh, bless her heart, she’s so beautiful. I think so too, but Lyra is not beautiful in the conventional sense. For one thing, she’s still pretty bald, as were all my babies for the first six to twelve months of life. And some of these well-meaning strangers tell me Lyra doesn’t look like she has Down syndrome, which in my opinion isn’t true. Her eyes have small openings and turn slightly upward in the outer corners as do those of most people with an extra 21st chromosome. A dear friend, whom I’ve known since I was fifteen, has a niece with Down syndrome. She called me a few days after I had written about Lyra’s diagnosis on Facebook. But first, she called her sister to ask advice on what to say or, perhaps more importantly, what not to say. I have had the occasional person apologize when I told them Lyra has Ds. Just last week someone asked me if I was devastated when I learned. No, I wasn’t but neither am I offended by these questions and comments. I put them into the same category I put the things people say to someone who is undergoing a difficult time in life, be it the loss of a job, the loss of a loved one, or a divorce—it’s better to say the wrong thing than to say nothing at all. On the other hand, many people tell me how all those they’ve known with Ds are incredibly loving. While I cannot speak to another person’s experience, I hesitate to categorize any group of people so broadly. It reminds me of the “noble savage” theory taught in anthropology classes. It is easy to dismiss the humanity of a group of people, such as indigenous populations, if they are described as entirely savage (generally prior to being conquered) or more advanced spiritually (generally post-conquest). Kids with Ds have behavior issues just as kids without Ds do. A mother told me that her daughter with Ds would use her hypotonia to make her body entirely limp when she didn’t want to do something. Ever hear of “dead weight?” It’s used to describe how heavy someone is to carry when they are unconscious and what a child with Ds is like when they make themselves go limp. Imagine that as a tactic in the arsenal of a toddler’s tantrum. In public. For now, Lyra is too young to have tantrums and so small it wouldn’t matter if she did. When someone apologizes because I’ve told them my daughter has Ds, I take it as an acknowledgement of the work I have ahead of me that I had not anticipated when I was pregnant. Like my mother-in-law once said to me, “No matter how sweet they say people who have Ds are, it is not something you asked for.” No, it wasn’t. But there are many things that a child can be born with that are not so easily diagnosed as Ds. Most autistic children do not begin presenting their symptoms until they are toddlers. And children with mental illness often appear perfectly healthy until adolescence or even later. The emotional journeys of parents who have children with autism or mental illness is as challenging, if not harder in many instances, than having a child with Down syndrome. The test for Ds is not subjective, it is clear and many families, like us, know their child’s diagnosis almost immediately after birth, if not before. Because I have two sons with learning disabilities, I have a sense of the anguish of parents who know something is not quite right with their child, but for years cannot figure out what the diagnosis is and, therefore, how to provide the appropriate support. As for her size, at her five-month check up with her pediatrician, Lyra was one ounce shy of weighing eleven pounds. That puts her in the fourth percentile on the growth chart for typical children. But there is another growth chart, one for children with Ds. On that chart, Lyra is in the 40th percentile for weight, 50th for height and 60th for head circumference. In other words, pretty average. 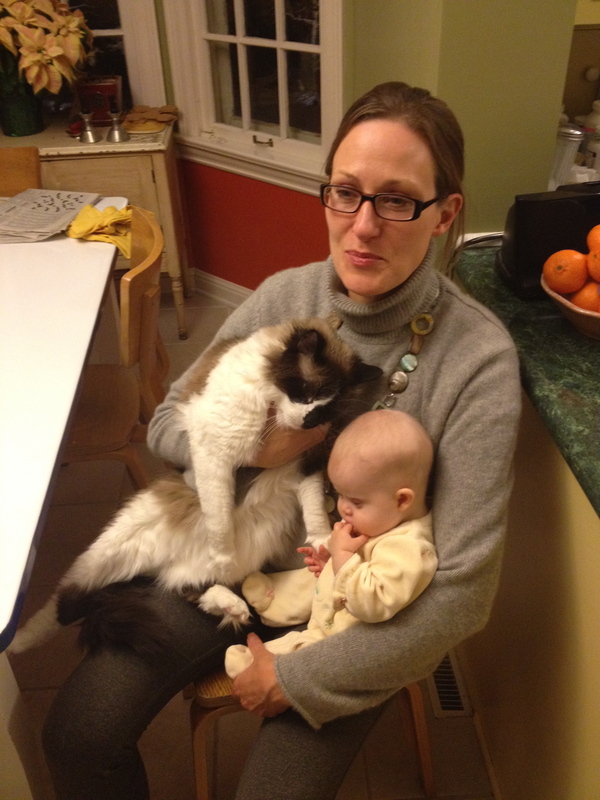 My boys, on the other hand, were all big babies; Hugo weighed ten pounds at birth and Jules was just two ounces smaller. None seemed to lose any birth weight and people often assumed my newborns were at least three months old. Before Lyra, I’d never used newborn-sized clothing for any of my babies. At five months plus, Lyra still wears some newborn items and nothing bigger than size 0-3 months. It’s like having a baby doll. In fact, more than once have I been asked, “Is that a real baby or a doll?” Seriously. Most of the time, I don’t notice Lyra’s size. She’s just our baby. It is when I see other babies that I realize how diminutive she is. At the home daycare where Leif and Lyra go each week, there is a family with whom we share some uncanny similarities. The mom has the same first name as me, though she spells hers “Hollie.” Last year, she and her husband were, like us, expecting their fifth child in August. Baby Jack is two weeks older than Lyra but when I see them together, they look months apart. For one thing, Jack is a third as big as Lyra, weighing more than 15 pounds. He has huge eyes and is developing beautifully. Next to him, Lyra looks like the newborn people mistake her for. And really isn’t that how it is with much of life? By comparison with others, we gain perspective on our own lives. What we do with that perspective is up to us—whether we open ourselves to envy or just observe an apparent difference, understanding that other differences, as well as similarities, exist. Throughout my childhood and into my 20s, I envied the lives of other people—from friends and family to complete strangers. I used to wish I’d been given up for adoption at birth or given to my grandparents to raise, so that I could have had a different life. But as time has passed and I’ve watched our lives unfold, I see everything before led to where I am now, with the family that is far more than I had ever imagined. Sometimes that means far more chaos and complexity than I’d imagined, but for the most part it means more love and contentment. And our wee teeny peanut, like some mighty-mini superheroine, galvanizes the seven of us as a family. Wonderful perspective, Holly. Thanks for sharing this.